Gratitude Stones from our Earth - Use The Law Of Attraction - A range of beautiful Gratitude Stones that will assist us to focus on positive thoughts and help keep our spiritual focus - The Realm Of White Magic On-line Ordering. Empower your Realm of spiritual well-being with the magic of Incense, Herbs, Powders, Crystals, Spells and much more. Specialists in rare botanicals, incense and magical supplies since 1989. A Gratitude Stone or 'magic rock' is a special stone you hold in your hand while expressing gratitude. It is a smooth stone to touch and feels good in the palm of your hand. 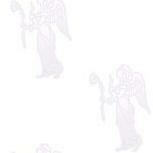 There are usually inspriational words written or printed on a gratitude stone. Gratitude Stones assist us to focus on positive thoughts and help keep our spiritual focus. Keep your Gratitude Stone in your pocket or next to your bed or altar. Carry in your mojo bags. Hold it often and focus on the happiest moments of the day. Think about all the things you appreciate and are thankful for. The Law of Attraction says you will attract the things you focus your energy and attention on so keep them positive. Take the time to feel the feelings of the wonderful things in your life! Your Gratitude Stone serves as a reminder to keep your spritual focus. A wonderful gift idea! 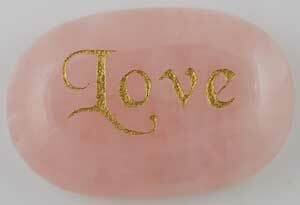 Focus your thoughts and intentions on loving thoughts while rubbing the word "Love" inscribed on this rose quartz gratitude stone to help bring love into your life. Approx 3.5cm wide x 8mm thick - being a natural stone, colours and shapes will vary slightly. 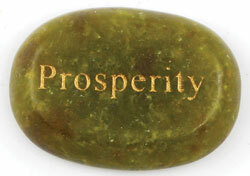 Intended to be used in helping to find focus for your intentions and desires, this gratitude stone has been sculpted from jade and engraved in gold with the word "Prosperity". Approx 3.5cm wide x 8mm thick - being a natural stone, colours and shapes will vary slightly. This oval gratitude stone with a rusty coloring speckled with gold flecks is intended to be held in your palm and rubbed over the words "Blessed Be" while focusing on friendly thoughts and well wishes. Approx 3.5cm wide x 8mm thick - being a natural stone, colours and shapes will vary slightly. This oval shaped, quartz gratitude stone prominently features a black or gold Pentagram engraved upon its front side. Approx 3.5cm wide x 8mm thick - being a natural stone, colours and shapes will vary slightly. 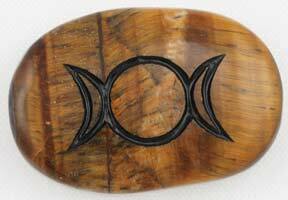 Engraved with a black "Triple Moon Goddess" symbol upon its front surface, this Tiger Eye worry stone is of great use within meditation and spell work. Approx 3.5cm wide x 8mm thick - being a natural stone, colours and shapes will vary slightly.